Welcome to the Bolton Lodge and Bryant Camp Fund. Thanks to the Friends of Bolton Valley Nordic and Backcountry along with the Vermont Land Trust and the State of Vermont, 1,161 acres of land in the Bolton backcountry have been purchased from private property owners and added to Mt. Mansfield State Forest. Now the GMC is working with Catamount Trail Association, the Friends of Bolton Valley Nordic and Backcountry and others to restore the two historic shelters on this porperty and create hiking trails that connect these shelters to the Long Trail in Bolton. A committee from the above organizations are soliciting donations to help create these trails and restore these shelters by donating to the Bolton Lodge and Bryant Camp fund. A donation page on the GMC website has been established to help bring this effort to completion. You can browse historical photos and newspaper articles of Bolton Lodge on the Friends of Bolton Valley website. See especially the wonderful Index to Historical Documents at the page bottom. Thanks to Jerry Lasky at the Friends of Bolton, and Dot Myer from the GMC for pulling together photos from many sources. A GMC grant application totaling $40,000 has been approved for the historic renovations of both Bolton Lodge and Bryant Camp. An additional $12,000 is available from the Conservation Alliance Structures fund associated with the acquisition of Bolton Nordic by the Vermont Land Trust with critical assistance from the Friends of Bolton Nordic and Backcountry. We need to raise an additional $30,000 to complete the two projects. Funds raised will support both the Bryant Camp and Bolton Lodge renovations. The GMC will work with Forest Parks and Recreation, Division for Historic Preservation, Department of Environmental Conservation, and Town of Bolton to renovate Bryant Camp during 2015. Located on the south flank of Bolton Mountain, it was transferred to the State of Vermont Department of Forests Parks & Recreation on the Bolton Nordic Tract of Mt Mansfield State Forest. The GMC’s Kurt Melin will lead this project with members of the Long Trail Patrol, the GMC and other volunteers. Contact GMC at 244-8327 if you want to help with this important project. We are finalizing a recreation trails grant and need to line up local and state approvals. We are also engaged in private fundraising so we are certain we can complete this project in time for the Winter 2014-2015 season. We envision making the cabin available for rent under a license agreement with FPR, much the same as how it has been managed for the past 20+ years. The Town of Bolton, the GMC and other partners are interested in historic preservation with regard to Bolton Lodge. The GMC has a long history of historic preservation of Long Trail shelters since our 1999 renovation of Butler Lodge. We have begun the Section 106 report process with Mary Jo Llewellyn to ensure we meet the Secretary of Interior’s guidelines for renovating eligible structures. We cannot pinpoint the construction date of the cabin but we are certain it is more than 50 years old. We propose to renovate Bryant Cabin which has been peripherally associated with the Long Trail until the trail was moved away from Joiner Brook. The GMC now has plans to connect the Bolton Access Road with the Long Trail with side trails including one to Bolton Mountain near the Bryant Cabin site. This is a natural fit as the GMC has the capacity and experience to manage camps and structures on public lands. Renovation plans include raising the building approximately 12” above current height above grade onto wood piers to improve airflow and drainage under the structure. The only other exterior changes planned are to increase the size of the second story front window over the entryway as an emergency exit from the loft and move the stove to the rear of the building with stove pipe through the rear wall to improve the safety of occupants. A new floor system will be installed and the access to the loft will be a framed staircase in the front of the building away from the stove, replacing the current ladder. The windows will be repaired and/or replaced in kind. The interior sink and countertops will be removed to increase interior space. The table will be replaced. Waste management is critical to responsible management of this camping opportunity. The GMC will install a new moldering privy to ensure a quality experience for all who visit Bryant Cabin. The privy will be sited to maximize use and minimize impact on the surrounding views and trails around the lodge. We do anticipate this project will need historic preservation review; folks closest to the cabin tell me it is original and had been renovated in the 1980s by Gardiner Lane. It may also require an amendment to the existing Resort Act 250 permit, 4C00436. The overall project manager is GMC Director of Trail Programs, Dave Hardy. 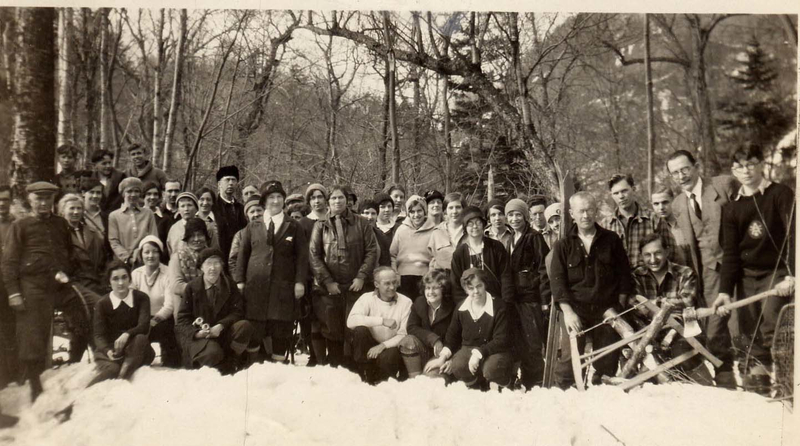 Browse historical photos of the Bolton Lodge on the Friends of Bolton Valley website, along with photos of Bryant (and current Bolton Lodge) photos.